Hi wine friends, and Happy Wine Wednesday! The last Saturday in February is Open That Bottle Night (OBTN), so I wanted to share with you the wine I opened to celebrate—a 2005 Genium Celler Costers. I’ve been holding onto this wine for 10 years, so it seemed like there was no better time to open in than this year’s OTBN. You can watch my YouTube video to get all my thoughts, as well as background on the wine, or you can keep reading! OBTN was started in 2000 by to Wall Street Journal writers, Dorothy J. Gaiter and John Brecher, and the whole idea is exactly like it sounds. We all have special bottles of wine that we never open because we’re always saving the wine for a special occasion that never seems to come. OTBN is the chance to open that bottle! My special bottle was given to me as a birthday present from my in-laws about 10 years ago, right after I started wine blogging. That year, they bought me several really nice bottles of wine, and it was recommended not to open the bottle until at least 2015, but it could cellar up until 2030. That seemed like a really long time, and I just don’t have enough patience to wait that long. If I’m being honest, I’m surprised the bottle lasted as long as it did. I think the only reason that happened is because I had a chance to taste several vintages over the years, which was enough to satisfy my curiosity and convince me I should hold out a little longer. 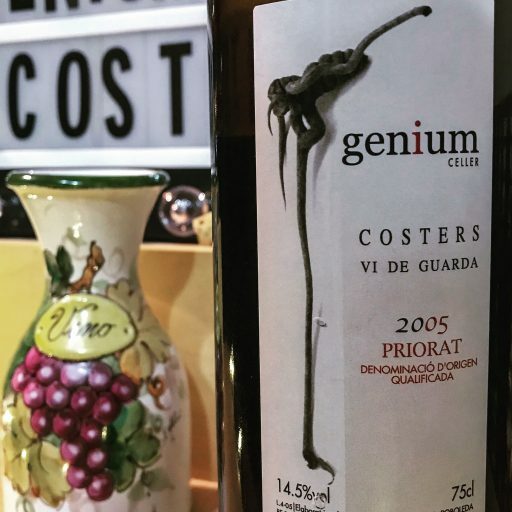 The 2005 Genium Celler Costers (winery) is a red wine from Priorat, Spain. It was a really dark ruby that was starting to transition to garnet, so you can definitely tell that it’s been aging. The nose was beautiful with dark cherries and dark plums. The fruit notes were at the back of the nose, with more earthy characteristics happening front. There was smoke, sweet tobacco, and a hint of new leather that reminded me of a new handbag type. There was also a touch of rose petals. In the mouth, the characteristics were similar, although the dark cherry notes were much stronger. The wine was medium bodied with grippy tannins. I could feel my gums contracting, which I love. I’m really glad I opened the wine this year, as it was ready to drink now. I would probably have been disappointed in it if I let it age much longer. As far as price goes, I couldn’t find any bottles of the 2005 or sale now, but it looks like it was selling for about $60 when it when it was still available. Overall, Genium Celler continued to impress me. The 2005 Costers was a really great wine, and the experience of drinking this particular bottles was even better because it was given to me at the beginning of my kind of adventures in wine, and I opened it specifically at a time that is set aside to open special bottles. This year was the first time I participated in OTBN, but it won’t be the last. I mean, what’s the point of having the good stuff if I never enjoy it? Did you participation in Open That Bottle Night (the last Saturday in February?) If so, what did you open? 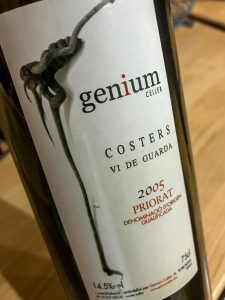 What are your thoughts on Priorat? Happy Beaujolais Nouveau Day 2018! Hi everyone…and Happy #BeaujolaisNouveau Day! Today, I’m 3 different Beaujolais Nouveau—2018 Château Gaillard Beaujolais-Villages Nouveau, 2018 Georges Duboeuf Beaujolais Nouveau, and 2018 Georges Duboeuf Beaujolais-Villages Nouveau. All three wines are $15 or less and will make a delicious addition to your Thanksgiving feast. Cheers! Question of the Day: Did you participate in Beaujolais Nouveau Day 2018? What did you open? Hi wine friends…and Happy #WineWednesday. Tonight, I’m sharing one of my favorite rosés, the Mark Ryan Winery’s 2017 Board Track Racer “The Vincent” Rosé. It’s a $15 wine that is worth every penny, it’s just really hard to find. So, if you’re interested in it, I suggest buying directly from the website early in the year because they sell out fast. Cheers! Question of the Day: What’s your favorite rosé? Hi wine friends, and Happy #WineWednesday! Quick reminder that October 10 at midnight is the last day to enter my giveaway of 4 PureWine’s The Wave histamine and sulfite filter and aerator (you can enter here). Today, I’m sharing my August and September 2018 Gary Vee Wine Club shipments, and tasting the 2017 Seinfried Wines Sauvignon Blanc that came in the August box. Cheers! The #GaryVeeWineClub is a monthly shipment of wine for only $55 a month. Depending on the month, you receive 1, 2, 3, or 4 bottles. Question of the Day: Are you a member of the Gary Vee Wine Club? Have you had a chance to taste any of the wines from the August or September shipments? What did you think? Hi everyone, and Happy #WineWednesday! To celebrate Albariño days (August 1-5, 2018), I wanted to open 3 with you. As you’ll see from the video, unexpected things can happen when I don’t taste the wine before recording. Cheers! 2017 El Terrano Albariño — $14 (I had trouble nailing down information on this wine, but I believe that it’s a collaboration between Valkyrie Selections, Bodegas Más Que Vinos, and Whole Foods.) I gave this wine 3.5 corks. First question of the day: Have you had Albariño before? If so what did you think of it? Bonus Question of the Day: Have you opened a bottle of wine that was bad? How do you handle it? Do you take it back to the store or do you just dump it and open a new bottle?